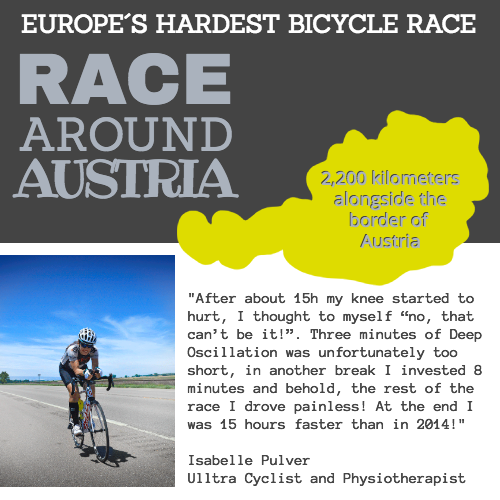 PhysioPod are delighted to received this excellent feedback from Isabelle Pulver of her successful self treatment with Deep Oscillation during the race, which helped her not only to finish in 2nd place but to be 15 hours faster than in 2014 in what is Europe's hardest bicycle race. "I have a super ultra cycling season behind me, amongst other certainly also thanks to Deep Oscillation! As an example: at the 24 hour race in the Dolomites (consisted only of huge altitude differences!) I was able to calm a beginning muscular knee pain with 7 minutes DO and then to continue the race without pain! The same happened to me at the Race around Austria-RAA. After about 15h my knee started to hurt, I thought to myself “no, that can’t be it!”. Three minutes of DO was unfortunately too short, in another break I invested 8 minutes and behold, the rest of the race I drove painless! At the end I was 15 hours faster than in 2014!" The Rossfeld is a leading, supra-regional competence centre for people with a physical disability without cognitive impairment from 5 to 65 years which employs approximately 270 people and provides for 330 people with a physical disability. "Isa Pulver, ultra cyclist women, winner of the Race across America 2015 and winner of the Race around Ireland (with course record) 2016 as well as last season winner of the Race across Italy and this year winner of the Race around Slovenia, finished second at this year's Race around Austria-RAA. This in the time of 4 days, 14 hours and 17 minutes. "It was an exciting, for me cool race," says the athlete overjoyed after arriving at the finish line. Ultra Cycling rider Isa Pulver was at the start of the Race around Austria-RAA for the third time after 2014 and 2017. After her victory in 2014 and her health-related task last year, she impressively proved that she belongs to the best women of the Ultra Cycling scene. This year the physiotherapist had a head-to-head race with Anna Bachmann from Austria. Also the 21 years younger Bachmann drove a strong race. Both athletes significantly undercut the previous record time of Trix Zgraggen (Switzerland) in 2011. With 53 minutes behind finally and a final time of 4 days, 14 hours and 17 minutes Pulver was very happy about her race and her placement: "For me it was very important, after my DNF last year, simply to get through and to undercut the time of 2014 if possible. I would never have thought that I would be 15 hours faster then". Best advertisement for the Ultra Cycling sport of the ladies. The two athletes took turns at the top several times. Only shortly before the finish Anna Bachmann made a decisive break and thus secured her victory. Isa Pulver says: "I didn't lose the victory, I won the second place. I'm just Happy! "said the 47-year-old. "Like many athletes, Isabelle Pulver has an incredible training diligence and is willing to make many sacrifices for her great passion, cycling. My contribution to Isa's career was not to allow any mistakes in preparation, competition and regeneration in the field of nutrition"
The race over 4.800 km and altitude differences of approx. 51.816m in total got finished by her in 10 days, 21 hours and 7 minutes. She won the “Ladies – Solo” category, she is ranked third among all ladies ever, and she has done the best time ever achieved by a “first-time-participant lady”. Isabelle Pulver Photo by Martin Kuhn. She won the race, which led her to cycle 2’200 km in 5 days only, while coping with 30’000m altitude difference. DEEP OSCILLATION® is non-invasive and non-traumatic. 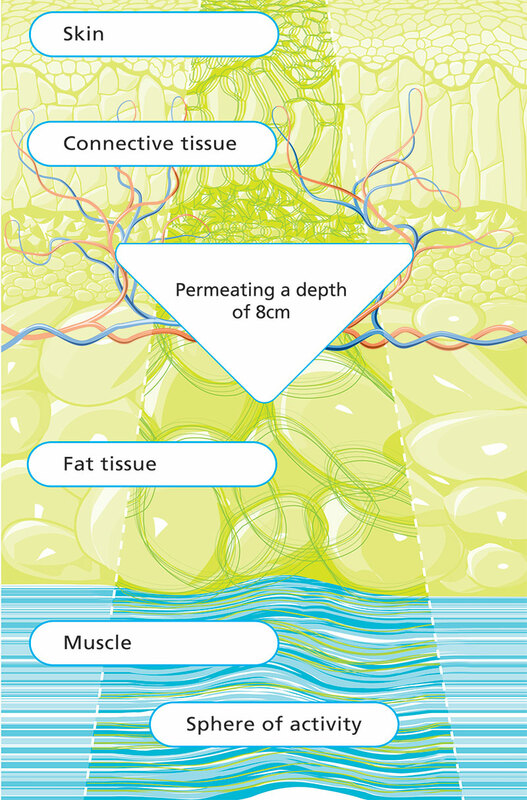 Intermittent electrostatic impulses are delivered through vinyl gloves or applicator heads, permeating an 8 cm depth through all tissue layers including skin, sub-coetaneous fat, muscles, blood and lymph vessels, with clinically proven effects in the interstitial spaces of the connective tissue.